In the second match of the 2018/2019 UEFA Champions League group stage, AEK Athens host Benfica at the Olympic Stadium searching for a maiden victory in Group E. AGONAsport takes a closer look at the Portuguese opponents. Watch LIVE from AGONAsport: AEK - Benfica, UEFA Champions League matchday 2 on Tuesday, October 2nd. Details here. SL Benfica are known as one of the “big three” clubs in Portugal alongside rivals Sporting CP and FC Porto. Having won 82 trophies, they are Portugal’s most successful and decorated football club, while never suffering relegation from the tpp flight. In an eye catching statistic, Benfica boast an estimated 14 million fans worldwide, a figure to be proud of. Their most glorious time as a club came in 1961 and 1962, when they went on to win two consecutive European Cups. Benfica hold the European record for the largest amount of successive wins in a domestic championship and the longest unbeaten run in Portugal when they reigned supreme in the 1972/1973 season. The Eagles, as they are nicknamed, were ranked twelfth in the FIFA Club of the Century ranking. In the 2017/2018 campaign, Benfica failed to defend their Portuguese crown, finishing in second place of the Liga NOS behind Porto with 81 points from 34 matches. On the European front, the Eagles performed terribly in a UEFA Champions League group against Manchester United, Basel and CSKA Moscow, losing all six matches with a humiliating -13 goal difference. Back in August, the club imposed heartbreak on PAOK in the Champions League qualifiers, defeating the Greeks 5:2 on aggregate after a ruthless 4:1 triumph in Thessaloniki. Their technical, attacking style of playing was too hot for PAOK to handle and they’re aiming to inflict the same pain on AEK. 48-year old Rui Vitoria, a former player, manages Benfica. After spending the majority of his playing days in the lower divisions, he hung up his football boots in 2003, opting to turn his hand to coaching. Ahead of becoming Benfica boss, Vitoria notably worked with Pacos Ferreira and Vitoria Guimaraes, eventually receiving employment with the Eagles in 2015. Incredibly, in the 2016/2017 season, he steered the Lisbon club to win all four Portuguese trophies and renewed his contract for a further two years. In three years at Benfica, Vitoria has coached the team in a grand total of 164 matches, claiming 113 victories, 25 draws and 26 losses. In the summer, 24-year-old Odysseas Vlachodimos penned a five-year contract with Benfica, arriving from Panathinaikos for a reported 2.43 million euros. Initially, it wasn’t certain whether he would play or keep the bench warm, but the German youth international quickly gained Vitoria’s trust and is Benfica’s starting goalkeeper. His fantastic showings have attracted the attention of Ethniki Omada head coach Michael Skibbe and he holds the right to compete for Greece through his family heritage. Greek midfielder Andreas Samaris is also on the club’s books, however he’s rarely gifted an opportunity to showcase his ability. 28-year-old Argentinian winger Eduardo Salvio is Benfica’s key man in attack. When playing against PAOK in August, he was crucial in sending the Thessaloniki club packing, notching two decisive goals in the second leg in Greece. Previously, Salvio won two UEFA Europa League trophies with Atletico Madrid in Spain, moving to Benfica in 2012 where he’s transformed into the team’s most productive player. The AEK defence will have to be at their best to keep him quiet. Pizzi, scorer of Benfica’s penalty in the first Champions League game against PAOK in Lisbon, is given licence to roam in midfield and pulls the strings. Now 28 years of age, Pizzi certainly isn’t a young prospect anymore, but he’s gifted and will attempt to dish out killer passes in Athens. 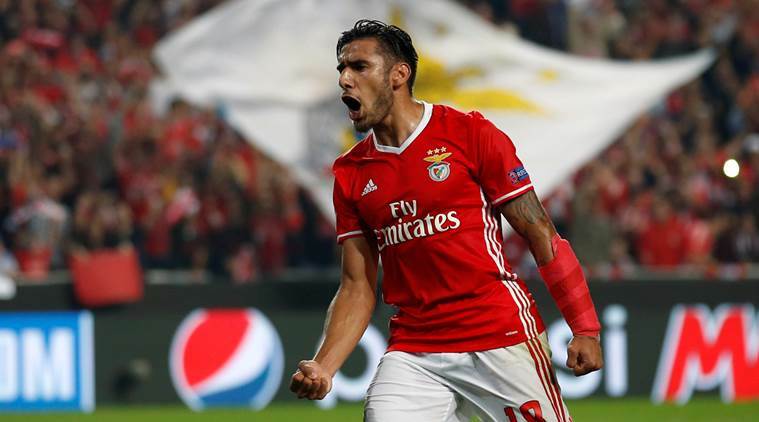 In the Champions League, Benfica needed to see off the challenges of Fenerbahce and PAOK to reach the coveted group phase, tallying 3:2 and 5:2 aggregate victories respectively. Domestically, they’re unbeaten in six Liga NOS games, however they only have four victories and currently reside in third place trailing leaders Braga by a mere two points. On the weekend, the Eagles picked up a disappointing 2:2 draw on the road against Chaves, conceding a last-gasp equaliser to the minnows.